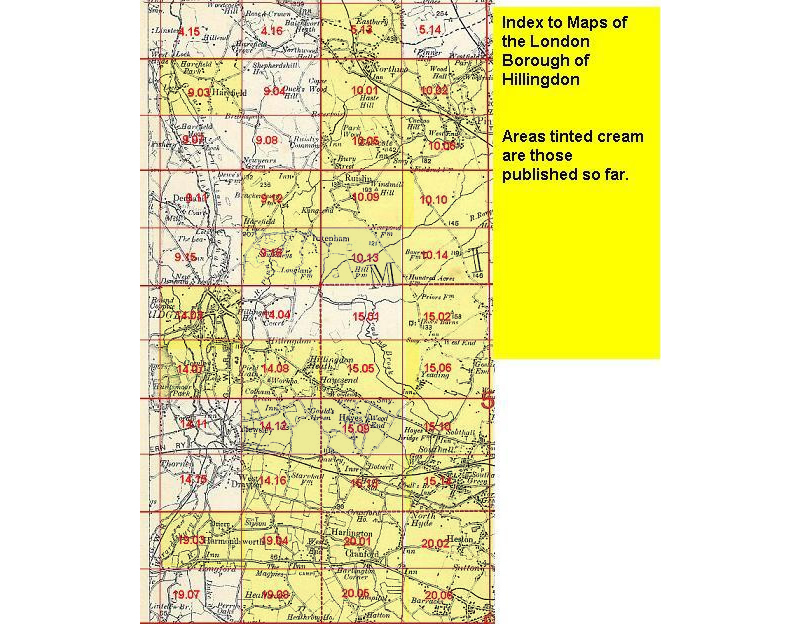 This detailed map covers the southern part of Hillingdon and eastern part of Cowley. Coverage stretches from St Lawrence's church, Cowley, eastward to Heath Road and Pistills Lane, and from St John's church Hillingdon southward to Moorcroft Lane. Features include Hillingdon Heath area, Pield Heath area, Bishopshalt School, Cony Green, St John the Baptist church, Hillingdon County Hospital, Hillingdon and Uxbridge cemteries, nurseries, Moorcroft, tramways, Isolation Hospital, Colham Green area etc. On the reverse we include 1933 directories for Hillingdon and Colham Green. The map links up with sheet 14.07 Cowley to the west and 14.12 Yiewsley to the south.